With the temperature having dropped, it’s time to turn our thoughts to planting now for spring colour. As the perfect antidote to winter, bulbs will typically flower from February to May with the general sequence being Iris, Crocus, Daffodil and then Tulip. Although spring seems a long way off, we recommend planting up pots and containers to encourage flowering in the warmer months. Pots offer younger plants shelter from the harsh winter weather and also help keep insects from eating and damaging the bulbs. 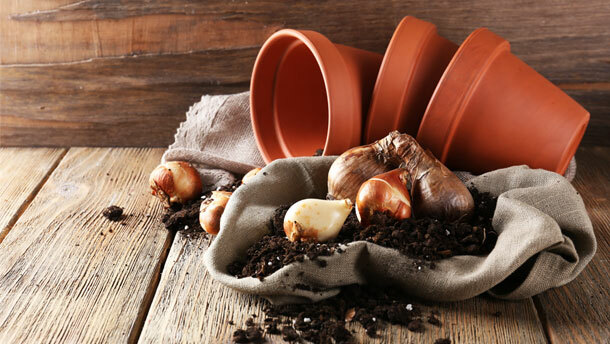 Make sure you choose a pot for your bulbs that allow them to grow. The most common mistake made when planting bulbs is not putting them in deep enough. It’s best to plant a bulb three times its own depth to prevent bulbs surfacing without flowers. Tulips are ideal to plant in November, and with many varieties, Tulips can boast a rainbow of colours. Double Tulips, also known as Peony Tulips, sport multiple layers and typically have a bloom size of six inches. These are sensitive to rain, so it’s best to find them a sheltered spot. Another popular option is to plant Daffodil bulbs ready for their sunny yellow to grace the garden in spring. Daffodils will thrive in damp soil and can be left in the soil to flower year after year. Haskins has a centre in Ferndown, Dorset and also in West End, Southampton.